This Alaska tour is a dream come true for value-minded travelers seeking to experience Alaska's breathtaking scenery and thrilling experiences. You'll start and end your tour in Anchorage with overnights also in Denali National Park and Valdez. In between destinations, you'll have the opportunity to witness scenery unlike anywhere else, with untamed wilderness and exciting wildlife sightings. A tour highlight is your cruise across the striking Prince William Sound. Witness the three-mile face of the Mears Glacier as you keep your eyes open for marine wildlife, such as otters, seals, and whales, all while you admire stunning glaciers. Another tour highlight is your journey to Talkeetna, a quaint town exemplifying small-town Alaska, from Anchorage aboard the Alaska Railroad. On this train trip, you’ll travel through gorgeous wilderness and understand Alaska’s allure. Two nights in Denali National Park gives you the opportunity to explore this amazing park, home to six million acres and North America's highest peak (20,320-foot Denali). Perhaps go for a hike or participate in an optional outing, such as a wilderness tour to seek out grizzly bear, moose, caribou, and more. But that’s not all…on this Alaska vacation, you’ll witness stunning views as you travel over the top of Thompson Pass, where you’ll admire unforgettable scenery, and into Alaska’s interior across the Denali Highway. The Denali Highway is a seldom-traveled road through true wilderness with frequent wildlife sightings. With magnificent scenery, opportunities to witness wildlife in the natural environment, and awe-inspiring experiences, this Alaska tour is a once-in-a-lifetime vacation! While wildlife in Alaska is often seen, early season (May-early June) and late-season (September) departures offer even greater chances to view wildlife. Visiting and participating in activities in these locations is subject to favorable weather conditions. Enjoy the spectacular colors of Alaska on our special fall foliage departures: August 27 to September 3 (if Mother Nature permits). Journey on the Alaska Railroad from Anchorage to Talkeetna; private, deluxe, air-conditioned motorcoach while touring. ANCHORAGE. Arrive in Anchorage and make your way to your hotel. This afternoon, you are free to explore the “Last Frontier” on your own. ANCHORAGE–ALASKA RAILROAD TALKEETNA–DENALI NATIONAL PARK. This morning, board the world-famous ALASKA RAILROAD for a memorable train journey to Talkeetna, the jumping-off point for climbers attempting to summit Denali (formerly known as Mount McKinley), the highest peak in North America at 20,310 feet. Enjoy strolling along the shops in downtown or take a walk to the river. Early this afternoon, journey to DENALI NATIONAL PARK for a two night stay. DENALI NATIONAL PARK. Denali National Park and Preserve, majestically dominates the park’s 6 million acres. Enjoy a free day for independent activities; a hike along the many wilderness trails might be of interest. Also take advantage of several optional outings, including a wildlife tour to seek out grizzly bears, caribou, moose, and Dall sheep; a raft trip down the Nenana River; or a helicopter ride over the park. Your Tour Director will have plenty of suggestions. DENALI NATIONAL PARK–THOMPSON PASS-VALDEZ. Relish one last look at the outstanding scenery and wildlife of Denali, before traveling across the Denali Highway. This seldom-traveled road was the first road to allow access to Denali National Park—a true wilderness with frequent wildlife sightings and amazing views of the Alaska Range. Next, climb over the top of Thompson Pass, well-known for the annual snowfall in the winter months, the pass offers summer guests unforgettable views. End today’s journey in the town of Valdez, nestled between the waterfront and mountains, giving it the nickname, Alaska’s Little Switzerland. 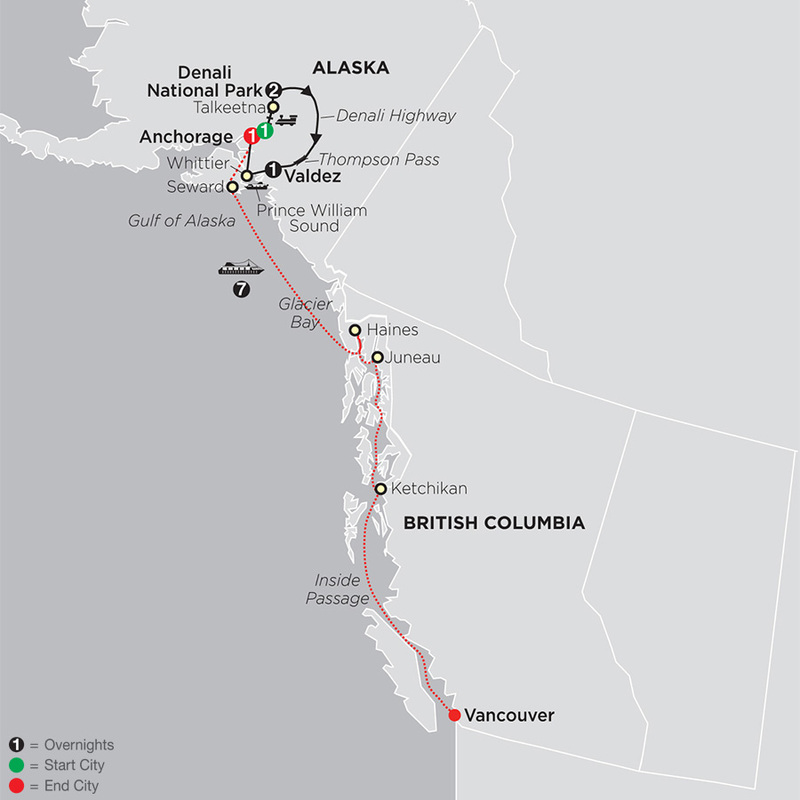 VALDEZ–WHITTIER-PRINCE WILLIAM SOUND–ANCHORAGE. Board a BOAT and travel across magnificent Prince William Sound. Explore the three-mile face of the mighty Mears Glacier and hear tales of the region as told by the Alaskan crew. Keep your eyes open and cameras ready for marine wildlife such as otters, seals, and whales while viewing spectacular glaciers. Return to Anchorage, Alaska’s largest city. ANCHORAGE. This morning, join a city sightseeing tour of Anchorage, with a visit to the ANCHORAGE MUSEUM, where you will see a quality display of artifacts of the native people of Alaska. The afternoon is free for independent exploring. ANCHORAGE. Your vacation ends this morning. "Born and raised in Anchorage, I love Alaska and cannot imagine living anywhere else. I grew up camping, fishing, and hiking and still enjoy spending time outdoors. I have led tours in Alaska for over 20 years and still enjoy sharing the history, culture, and economics of my home state. I am a teacher during the school year and apply similar lesson plans and organization to each tour. My goal is to share Alaska with every guest as I would share it with a relative. Above all else I want my guests to have fun, but that does not mean that they won¿t learn a lot about Alaska and being an Alaskan while they are enjoying The Land of the Midnight Sun!"